We would like to take a moment to explain our shipping policy as well as our fees. 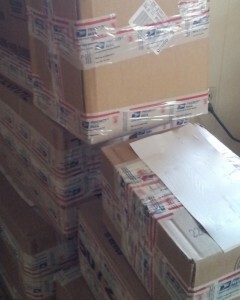 Due to an increased volume of packages we no longer ship items in house. Any purchase out of our area will be shipped via The UPS Store in Taylors, SC. After the auction ends any items that are not picked up will be transported to The UPS Store at 2801 Wade Hampton Blvd in Taylors, SC. They will contact you regarding your shipping total. If you need to contact them, please call (864)268-6068. If your items are transported to the UPS Store, we charge a $5.00-$15.00 transport fee (depending on the size of your order) to cover our time, gas & fees. If you do not pick up at our onsite auction, your item(s) will be transported to the UPS Store located at 2801 Wade Hampton Blvd in Taylors SC. Please contact them immediately to arrange for pick up. We no longer transport items to our facility. We are not responsible for fees you incur while your items are stored at The UPS Store.